Students will remember this Quiz because there's a catch...the directions are at the bottom of the page. Many students breeze through this quiz to see the directions specifically asked them NOT to answer the questions. 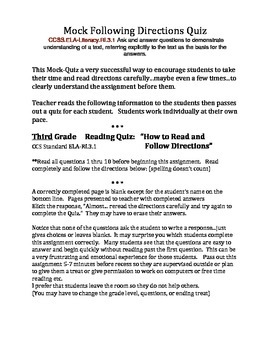 There is a teacher direction page and a work page for students. You may need to adapt questions to fit your specific grade level and school. This standard applies to third grade, but all students can benefit from practice in following directions.